I hate going to the doctor. I hate hearing of friends who are having to go for testing and medical procedures. Science and research has supplied us with wonderful cures and fixes for ailments that in the recent past would have spelled the end of one's life. But for all my dislike for tests, procedures, etc. I am very glad they are there. I would have died decades ago had I not had - by today's medical knowledge - a very simple surgical procedure. At that time I was a fanatical, religious zealot who obsessively read and quoted scripture and tried to be "pleasing unto the Lord" in all my ways. I was a firm believer in "The Full Gospel" message of the charismatic movement which said that Jesus not only saves your soul but is also the healer of your body. So when I became doubled over with abdominal pain one morning, I fervently prayed for hours for "the Lord" to heal me but nothing happened. After ten hours of drowning in pain that was making me close to psychotic, I had to admit to myself that apparently Dr. Jesus was not making house calls that day. I asked my then ex-wife to take me to a hospital ER where they did an emergency appendectomy. Had I waited upon the Lord for a few more hours, my appendix could have burst and dangerous bacteria would have spread throughout my body. That could have been the end of me. To this former fundamentalist preacher and evangelist, I now find it odd that people give "God" credit when the actual person who performed the "miracle" of healing is a human. A human who spent years in specialized training and who then had to pass a rigorous testing process before he or she were authorized by society to be able to slice and dice on living persons??? God was not in the picture at all when the doctor was studying for hours and learning how to practice medicine. The scientific training that physicians receive does not include any course work on the power of prayer to heal. Human beings, using their intelligence and ability to evaluate and make changes, are the ones who deserve the credit for the advances in medicine. God never showed us anywhere in his "love letter to us" (the bible) how to perform these amazing medical procedures. In fact, "God" never even bothered letting us know about microbes, bacteria and viruses or what we need to do to prevent these things from snuffing out the lives of children and adults. After years of living, and being in plenty of hospital rooms to offer prayer of healing for the sick and dying, I eventually came to the conclusion that "God" was not in the healing business. "God" doesn't have the training or background to offer pointers to highly trained surgeons about how they are can properly do their job. In fact, I'm very confident in saying that "God" would have hell of a hard time even passing any medical boards! If you find comfort in the very poetic type of mumbo-jumbo, god-talk about how "HE" standing behind and guiding the hands of every surgeon, then so be it. But don't confuse comforting mental images of what you believe is happening with what actually is taking place: healing based on hard science and evidence. So do surgeons of the Islamic faith have the invisible presence of Allah standing next to them who guides their hands to properly do their job? How about doctors of the Hindu faith who hold to a belief in multiple deities? Are they surrounded by invisible Hindu gods and goddesses as they do their healing work? How about Mormon doctors whose faith teaches that Adam, the first man, is the God of this planet, and is the literal Father-God of Jesus, his son? Is Adam-God helping these LDS doctors to perform at their best? Per your fundamentalist, Christian beliefs, these individuals are spiritually deluded for believing in such heretical "doctrines of demons," and are actually, physically, inhabited by demonic spirits. 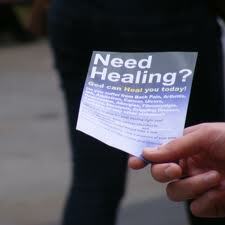 So demon-possessed doctors are helping to heal you and your loved ones?? Should you at least give credit to where credit is due: Praise Allah, Praise Vishnu and Adam-God for these miracles of healing! I do have a heart of gratitude and thanks when medicine is able to heal a person of an affliction. I express this attitude of gratitude by supporting taxes - and donating money - for medical research and education. I believe that doing these things will result in more healing than all the prayers for healing I use to make to a God who wasn't even there.